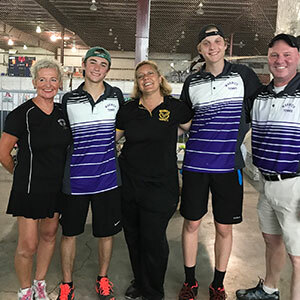 On Friday, May 20, 2017, Warwick Senior Tennis Captain Pearse Algiere and Junior Dean Redmond won the 2017 Orange County Interscholastic Athletic Association Doubles Championship. Their journey began last year when the two first teamed up to enter postseason play as Warwick’s Wild Card, finishing 3rd in the County Tournament and 4th in the Section 9 tournament. Algiere and Redmond entered this year’s County Tournament as the 2nd seed. They faced Kingston’s Wild Card team in their first match, defeating them (6-3), (7-5) in the round of 16. Warwick’s Wild Card team then moved on to face Warwick’s 1st Doubles Team, a team they knew very well. Warwick’s 1st Doubles Team, composed of Senior Marc Romero and Junior Nick Villegas, had a tremendous Spring tennis season with an overall record of (11-2). Unfortunately, only one Warwick Team would be able to advance to the semifinals, where Algiere and Redmond defeated their teammates (6-1) (6-2). Entering the semifinals, Warwick’s wild card would face the team that knocked them out of Counties last year, Monroe’s wild card team of Zach Price and Collin Gordon. Algiere and Redmond played a nearly flawless match, avenging last year’s loss in defeating their opponents (6-3),(6-1). Algiere and Redmond found themselves in the finals of the doubles championship, facing 1st overall seed Newburgh’s wild card team. Warwick’s duo prepared for the tough match ahead by participating in extra workouts together over the last several weeks. The first set seemed to favor the Wildcat’s style of play, resulting in a set score of 6-1. Algiere and Redmond refused to let down their intensity as they battled back and forth in the second set. The final point of the match was a clear representation of the two teams’ fight, as the competitors exchanged 15 combined hits. It’s been 27 years since Warwick Boy’s Tennis had a Doubles Champion. In 1990, Justin Lorgan and Chris Zimmerli won the OCL Doubles’ Championship with their Coach, John Garcia.